Von Tilzer vs Jerry Vogel Music Co.
D.C.,S.D.N.Y. (10-5-1943) ¤ 53 F.Supp. 191, affirmed 158 F.2d 516. The facts that pioneering movie director D.W. Griffith shot The Birth of a Nation and that the completed film was first shown in 1915, are incontestable. (The facts that the movie led to pleas for film censorship and to outcries against its supposed racism, are also incontestable, although both are outside the scope of this web site. The film continues to be discussed in any authoritative comprehensive history of motion pictures.) What became contestable was whether the renewal application filed on its copyright was valid. The copyright was dated February 6, 1915, and was filed February 13, 1915, by D.W. Griffith as a “motion picture photoplay not reproduced for sale; in other words, as an unpublished work”. Epoch Producing Corp. was formed February 6, 1915, which was after The Birth of a Nation was made. It was to Epoch that the renewal certificate was issued in 1942. “Moreover, there is no specific reference in either assignment [two April 17, 1915, transfers by Griffith’s corporation to Epoch and profit-participant Dixon] to the renewal term. This deficiency has generally been held as a matter of law, absent contrary evidence, to preclude a holding that a transfer of renewal rights was intended… . While Epoch correctly observes that the assignment here is from a corporation and not from an individual author,… DWG Corp. was in effect the author’s [Griffith’s] alter ego… . The transfer from the DWG Corp. is analogous to a transfer from the individual author and … the assignments must be limited in their effect to the original term copyright.” In both respects, Epoch failed the burden of proving it had acquired the rights in the film for the renewal period. Shapiro, Bernstein & Co. vs Jerry Vogel Music Co.
C.C.A.N.Y. (3-18-1947) ¤ 161 F.2d 406, certiorari denied 67 S.Ct. 1310, 331 U.S. 820, 91 L.Ed. 1837. After the case had been tried in district court, and been appealed in appeals court, it returned to district court. One aspect of this complex case “put in issue (1) the copyright of the unpublished song and lyrics ‘Melancholy’, the song of which was written by Burnett and the lyrics by Watson in 1911 and copyrighted on October 13, 1911; (2) the copyright of that song and new lyrics composed by Norton in 1912, and then transferred to Bennett; and (3) the third version of that song under the name of ‘My Melancholy Baby’, published in 1914, which contained Burnett’s music, Norton’s lyrics, and an additional chorus in march time. The decision here was that “Burnett’s renewal of the 1912 copyright was ineffective” insofar as what was added by the 1912 copyright to the work contained in the 1911 copyright, and that thus “there was no copyright protection in the United States for the Norton lyrics, published in 1912 under the title ‘Melancholy’, and again in 1914 under the title ‘[My] Melancholy Baby’, which were held to be in the public domain”. The music enjoyed continued copyright. “The Circuit Court of Appeals decided, as to the 1912 version, that Bennett had obtained a valid copyright, that Burnett and Norton were joint owners thereof, that Burnett’s renewal, assigned to the plaintiff, inured to the benefit of both plaintiff and Norton’s son, whose interest passed to defendant by the latter’s assignment… . With this decided, the court in this third decision addressed whether the third version of the song was a derivative work, as summarized under derivative versions and new matter. Yet another aspect of this case is under term period calculation. USDC, SDNY (11-14-1985) ¤ 621 F.Supp. 631, No. 80 Civ. 6564 (JES). Although IFEX argued that its renewal should be considered valid owing to language in its contract which gave it “‘rights of renewal’”, this “could only be reasonably interpreted as granting IFEX a right to secure a renewal of copyright in name of the author.” Section 24 of the 1909 Act was cited. P.C. Films Corp. vs MGM/UA Home Video Inc., MGM/UA Communications Co., Warner Home Video, Inc., Turner Entertainment Co.
P.C. 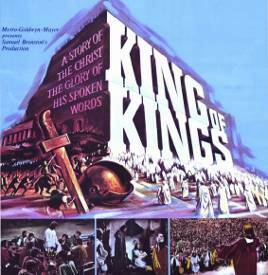 Films and Turner Entertainment each filed renewal applications on the 1961 film King of Kings. The circumstances by which this film got made, and the resolution of a dispute over who had the rights to distribute the film during the renewal term, are summarized under termination of grants provided by entry into new copyright term. Samuel Bronston Productions Inc. produced the film, which MGM contracted to distribute. Bronston’s rights were acquired by P.C. Films in 1967, and MGM’s rights were acquired by Turner later. “The film was registered in 1962 as a copyrighted work under the Copyright Act of 1909. The application to register the copyright, filed with the copyright office on October 15, 1962, was signed by MGM in the name of Bronston and MGM as co-claimants… . Was there an unauthorized renewal? In preventing the copyright period from prematurely expiring, Turner was acting on behalf of P.C. Films (as well as itself). “The drafters of the 1909 Act were well aware of the difficulty of contacting distant authors who no longer wished to enforce their copyright rights. In [§]24, for example, Congress provided that a proprietor could secure and renew copyright on a composite work when the individual contributions were not separately registered. The provision was apparently addressed to the difficulties such proprietors had previously faced in locating and obtaining the consent of authors at the time of renewal. See H. R. Rep. No. 2222, 60th Cong., 2d Sess., 15 (1909); 1 Legislative History of the 1909 Copyright Act, Part C, p. 56 (E. Brylawski & A. Goldman eds. 1976) (statement of Mr. Elder) (hereinafter Brylawski & Goldman); 5 id., Part K, pp. 18-19 (statement of Mr. Putnam); 5 id., Part K, p. 77 (statement of Mr. Hale). See also Elder, Duration of Copyright, 14 Yale L. J. 417, 418 (1905). The effect of the consent requirement under the Court’s reading should not only be to forbid the author of the derivative work to ‘employ a copyrighted work without the author’s permission,’ ante, at 232, but also to penalize him by depriving him both of the right to use his own new material and, in theory, of the right to protect that new material against use by the public. It is most unlikely that a Congress which intended to promote the creation of literary works would have conditioned the protection of new material in an otherwise original work on ‘consent’ of an original author who did not express the desire to protect his own work.